Last week was a busy one. I am not complaining at all, as busy is good, but by Saturday evening training and everything caught up a bit and I finally got hit by a cold. I must admit it was a little more than the usual man flu that goes around! It has taken a few days to get through but I hope to be fit for the IMRA (Irish Mountain Running Association) race next Saturday. 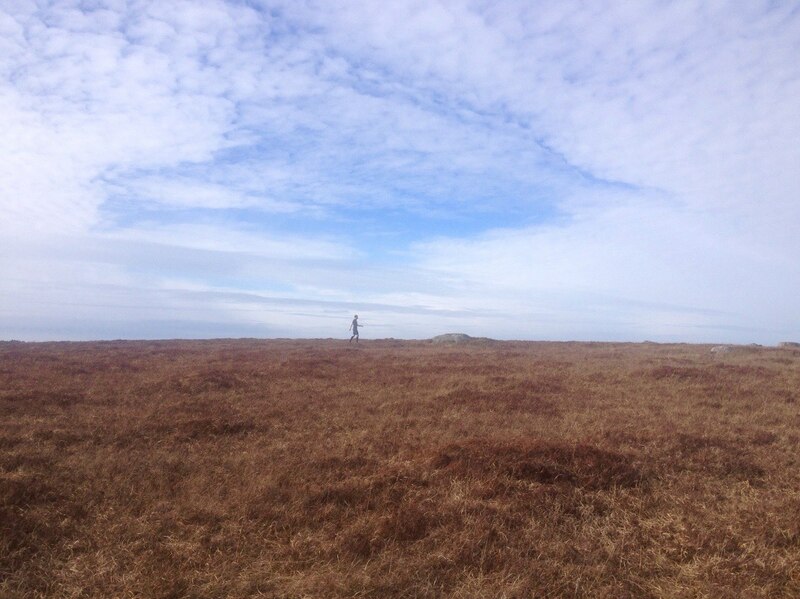 A 25km run in the Wicklow mountains. Before I got ill I had a nice training session on the hills near home with Emma. Check out the great weather, as spring finally arrives in Galway! Last weeks training went well, with some physio and yoga thrown in. This week will be more a battle to get fit for Saturday, but I intend on getting there. I am lucky enough to get advanced kayak training at work and hope to share some exciting white water videos with you later in week. Maybe a little more adventure to my recently quiet blog. For now it is time for more lemon and ginger tea and another early night to help the body heal. Check out this short core session I tried recently. Ali Kamenova has some really tough short yoga/core workouts that can be perfect for before or after a run. I decided recently that it is time to once and for all sort out my ankle problems. They have been really good the last few years and I think the adventure racing has helped but I know the weakness is still there and I intend to sort that. Every little twing taken away is another chance to improve. I started going to physio once a week and after only three weeks I already feel an improvement. It also focuses the mind on sticking to particular exercises. The clip below is a great example of exercise for anyone interested in strengthening an ankle. An up and coming physio friend of mine shared this quote with me tonight. It sums up injury quite well and relates to old injuries I have suffered. So I hit out for my run tonight after a few minutes reading these quotes. I find it hard not to think about injury but really appreciate that when you train the right way and do the right things, injury comes less often than before. I ran the first 8km into sleet and rain tonight, not to mention a gale force wind! Exilerating stuff but not really the most fun. The next 11 km were far more enjoyable with the conditions at my back. I maintained a steady speed and enjoyed it as much as was possible on such a crazy night. The fun of winter in the West, but then again it is great to get out. Sorry for the lack of posts since Thursday but I twisted ankle on my last run before Achill race and was a little annoyed for a day or two not to mention needing a bit of time to decide where to go from here. Luckily it was only a small twist and I am recovering well. Unfortunately though I feel it is linked to my return to football and I have made the decision to quit playing the sport I love so much, for a while at least. A recurring injury can be incerdibly frustrating and I feel it is time to focus on my racing a little more. I will manage some coaching to keep in touch with football. As of yesterday I started a new training plan focusing on cycling, running and hopefully fitting some kayaking in somewhere. I intend to increase my endurance while still working on power and speed. This will take discipline, alot of training and hopefully enjoyment too. A fun road ahead. I started slowly yesterday with a gym session and hit the road today for a reasonably long low intensity cycle . 54km of coastal cycling. I have a link below to the stats. A basic plan is to get some low intensity training in with a long run and a long cycle during week, combining this with strength work in gym. Then a hard session on bike and hill running at the weekends. I will post a more detailed training plan soon. This may help those of you out there interested in new personal records in adventure races and similar events. I recently started listening to a podcast, which alot of you may of heard of, called running academy. I have a link below but there are some good casts, including one by Matt Fitzgerald on 80/20 training. This is training at low intensity 80 percent of the time and high intensity for 20. I intend on giving this a shot to see how it works. My training to date has not included enough low intensity distance work. If you train at low intensity more of the time it means you can then put everything into those short hard and fast sessions. A theory at least, but I reckon it could be a good one! 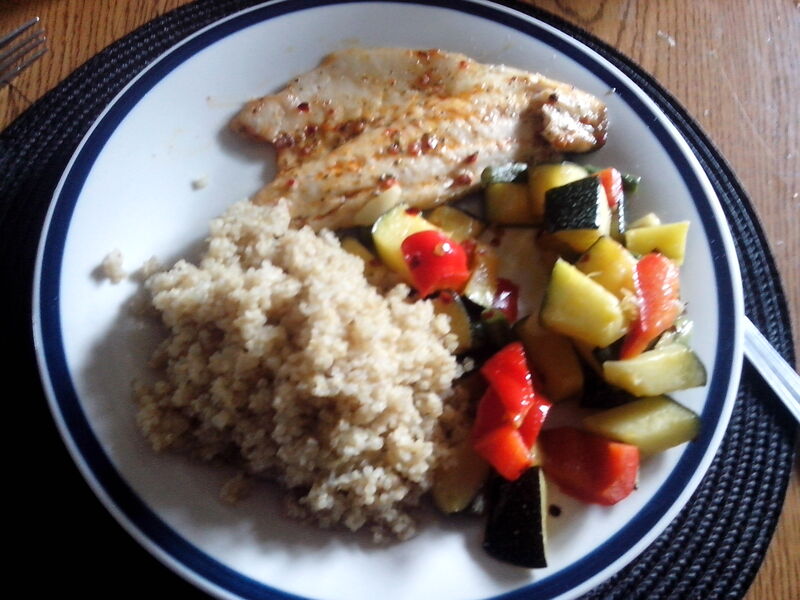 Sea bass, Quinoa and mix vegetables (mostly from garden). 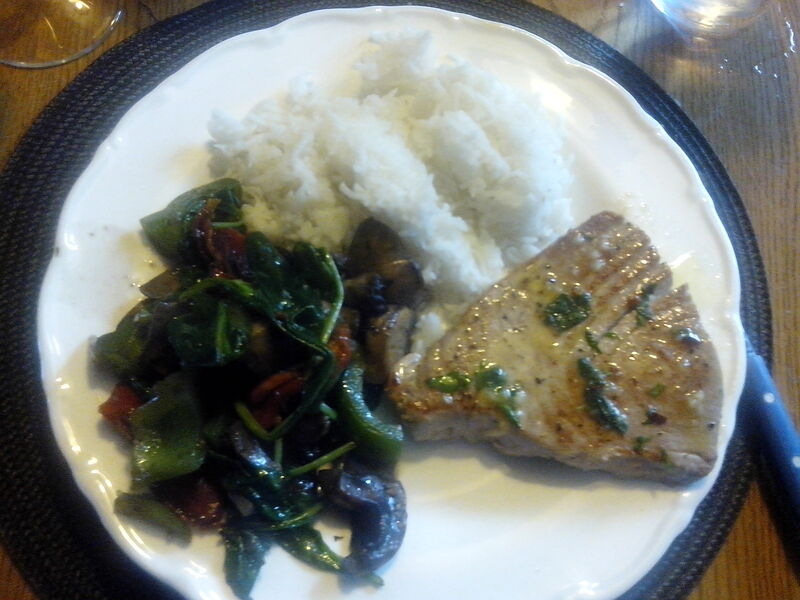 Tuna Steak, rice and mix vegetables. These are two nice dishes I had this week. Really fast cooking and yet really tasty food. There is no doubt diet helps with everything, and I find now that as soon as I stray from it too much I feel it in my training. I am never someone to jump at products or anti inflamatories and the likes for injuries but this week I needed a fast solution to my wrist injury. I turned to Arnica and I have to say I think it has helped massively. I normally find time, rest and the right physio work will fix most injuries but this Arnica seems to have worked wonders. Then again maybe it was only a small injury. I don’t think il ever know for sure ! I managed a 12km run last night which included intervals in the middle of 4x1000m runs on the track. All in all I averaged out at 3.57 min/km for the run so happy enough with that, and my wrist didn’t react much at all. The bike tomorrow will be the ultimate test along with the kayak on Tuesday. 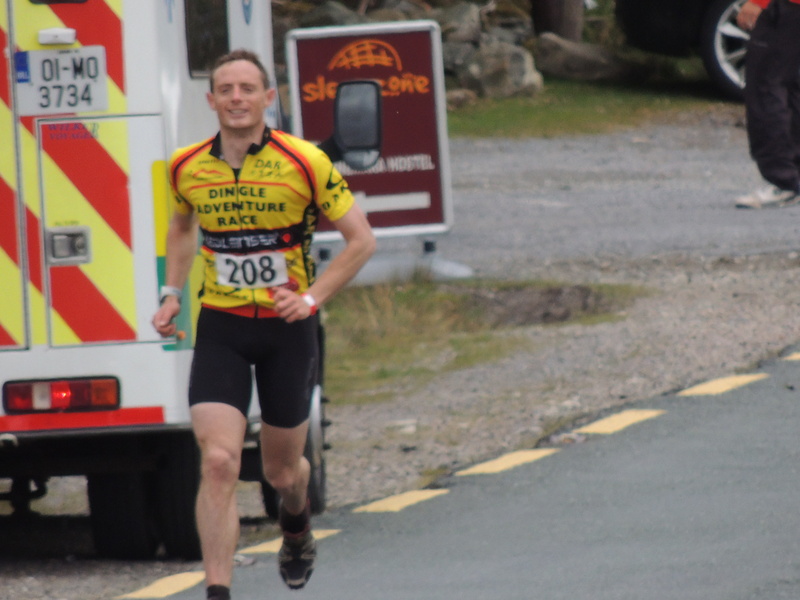 Gaelforce West, the biggest attraction for most adventure racers is next Saturday so my taper will start from Tuesday on all going well. A good website, well worth a look. 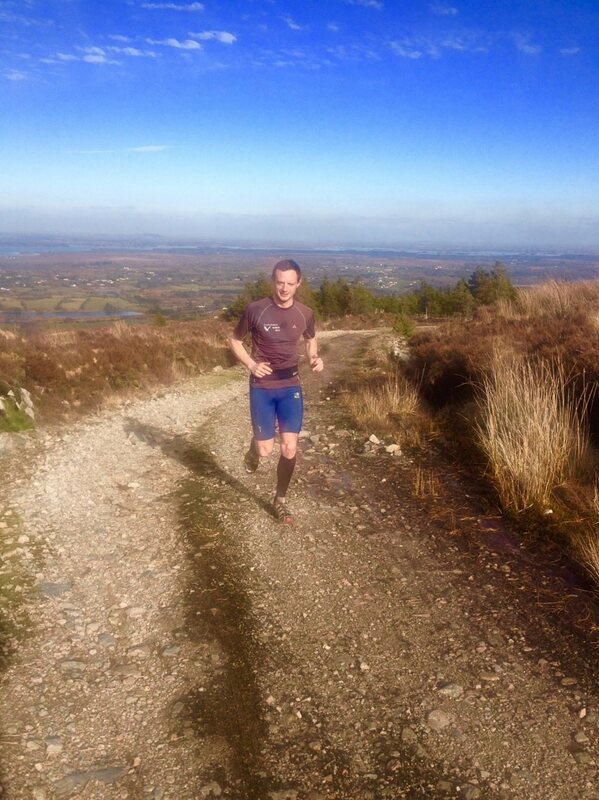 A fellow adventure racer and Gaelforce North racer ! Excellent race report too. 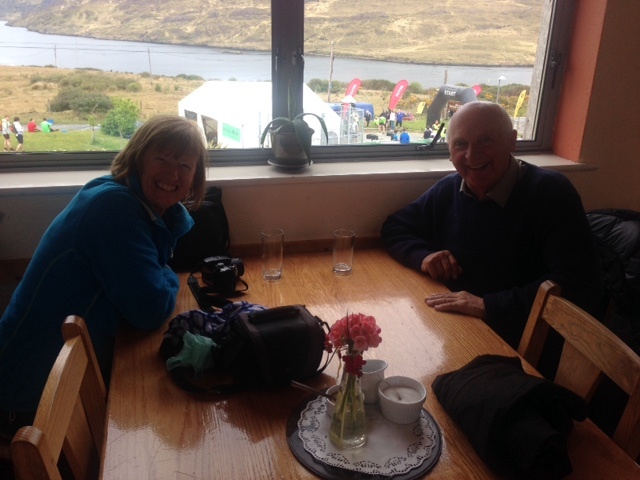 I made my way to Dingle, Co. Kerry on Friday evening, registered for the race and got an early night. I had never taken part in this race before so I was looking forward to the test. At 8.20am I made my way to the start line. This race started on the bike for 25km, then a 10km hike/run of Mt Brandon, then a 10km road run, followed by a 2km Kayak and finally a 1km run to the line. On arrival I noticed that the field was going to be incredibly strong with Adventure race winners on all sides of me at the starting line. A great atmosphere, yet I knew this was going to be one of my hardest races ever. Little did I know what lay ahead in the next 3 hours! At 9am off we went, following the race car to the foot of the Connor Pass climb where the fog horn sounded and we were off. Withing minutes the race was split into a few groups. I stayed in the second group chasing the lead pack of 5 or 6 riders. The legs were feeling good all the way up the climb and I knew if I held this position I would be within touching distance of the lads ahead. The descent wasn’t quite as much fun! A very steep fast descent with slippy roads which I have to say I’m still not that good at and definately need practice. In saying that I managed to keep within the top 15 when we reached the first dib and bike drop off. So now the fun began, Mount Brandon loomed in the distance and I could see the orange marker flags heading off in the distance as I made my way up the muddy tracks. I passed 5 guys in the first 2km and then 1 guy passed me so I knew I was doing ok and if I could hold my own I would be fast on the mountain descent.The views must of been spectacular but to be honest I only looked around for about 10 seconds as it was a very technical course with lots of trip hazards. At one stage 2 sheep bounded out right on top of me and tore off down the mountain. I just thought how I wished I was going down just like them. In total it is a 950 metre ascent and towards the end there is a really steep stretch just to finish you off. I completed the climb in around the hour and was ready for a long descent before the 10km road run ahead. Within 5 minutes of heading down my race changed dramatically. I tripped and landed front first on a pile of rocks. In saying it was a disaster would be a overstatement as I wasn’t badly injured. I was cut on my hands and face, bruised on my left thigh and very sore on both knees. I remember thinking and saying outloud ” no way am I stopping now after travelling all the way to Kerry, I will finish in the top 10″. Of course I shouted this with quite a few explitives thrown in and some funny looks from a marshal just up the mountain! I dusted myself down and began to descend once more. I hadn’t lost any race places but man was I sore. All I could think of was Scott Jurek’s book “Eat and Run” and how he had fought through the pain of torn ligaments to win an ultramarathon. 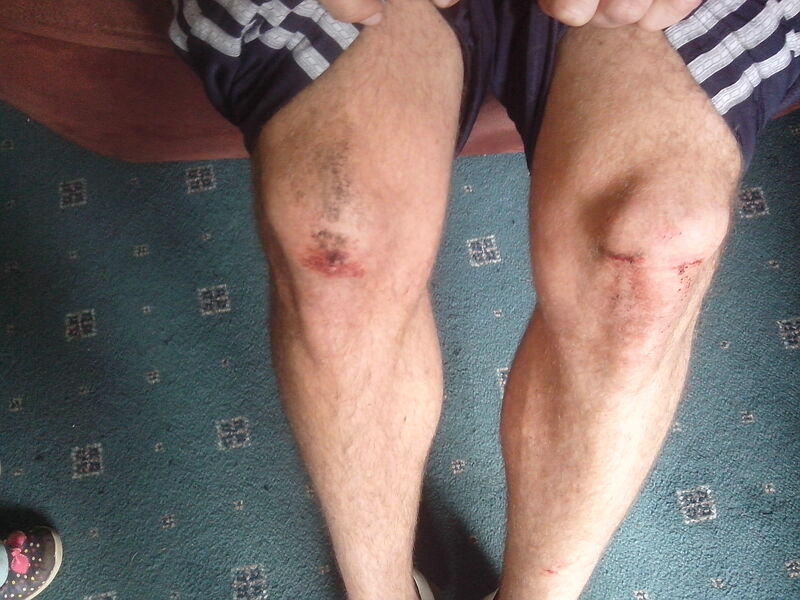 All I had to do was run 15km more with a few bruises and scraps. My mountain descent turned out to be ok but my 10km road run was slow. Along with the pain I was beginning to burn as well. I kept going and until 8km was completely on my own. At this point 2 athletes past me. The bells rang out in my head that I was now in 9th place. At the foot of the mountain I had been informed I was in 7th. 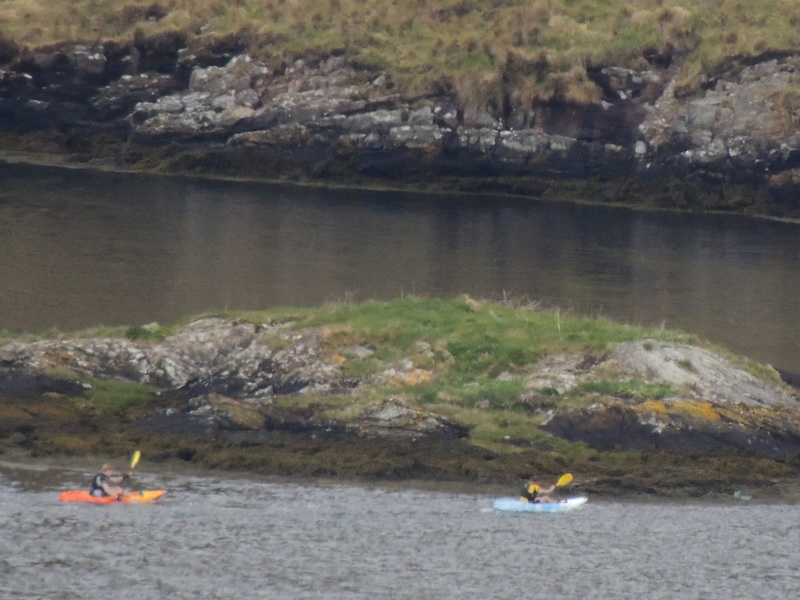 I arrived at the kayaks about a minute behind the 2 that had just passed me. I hopped on board, in pain, and really not expecting I would be able to get out of this boat ever again ! Within 5 minutes I had passed one of the two guys ahead of me and was up to 8th. I completed the 2km in under 10 minutes and finished the last 1km of race strongly enough to cross the line with 7th place in sight. A total of 3hours and 12 minutes. All in all this race was more great experience for me. It also thought me that I have the will power to keep going when it gets really tough. In adventure racing your finishing place means very little if you haven’t beaten yourself. I certainly feel I bet myself in more ways than one yesterday. Some photos below and more to follow as well as race results. 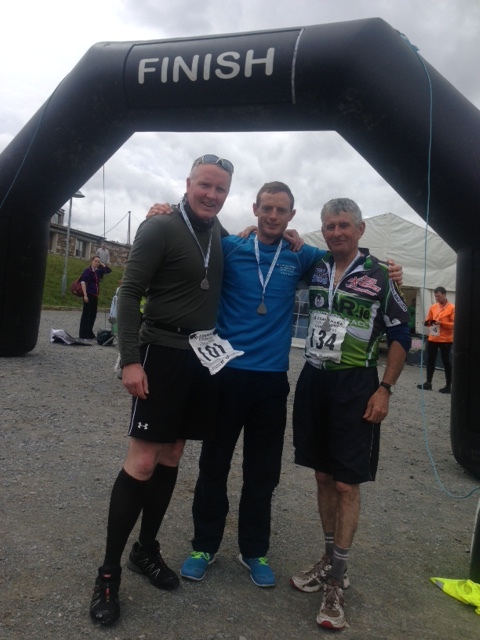 Well done to all involved and thanks to the organisers for a quality race. A great weekend with friends. This annual event on Arranmore island in Donegal, basically a country of it’s own has become an annual event for me since 2008. I have made lots of friends and always feel so welcome on the island. 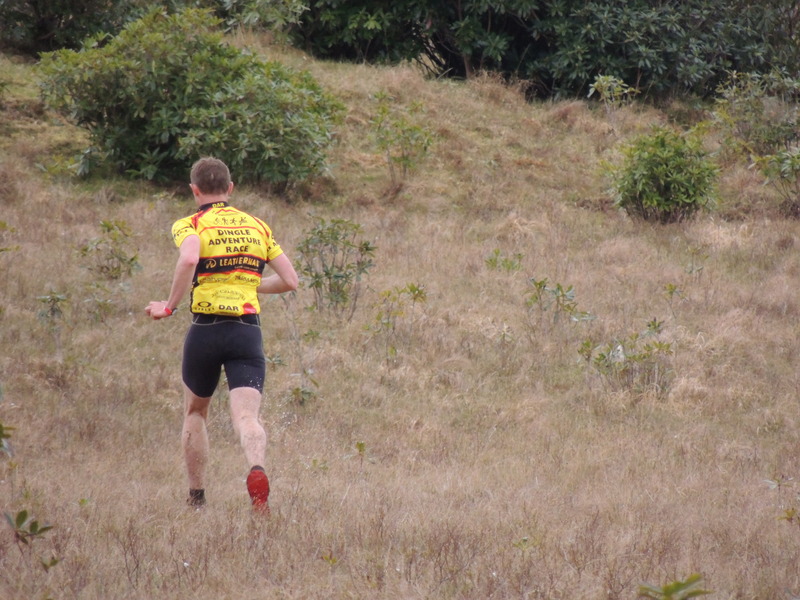 This year I finally got the chance to run a lap of the island with one of the group, Ollie Mullins, that competes at a high level in half marathons. He aims to some day represent Ireland at masters level. We were knocked out of the football in the group stages therefore we decided to delay the time in the pub and complete this 11km.amazingly scenic run of the island. I wish I had a camera with me but some day this would be an ideal place for an adventure race. Not only hilly, boggy and scenic for running but the majority of roads are tarred and the biking could be fantastic. I have attached a map of the run below and hope to get a hold of a few more photos. We travelled the 176 miles home this afternoon all in agreement that this annual event will continue to happen for many a year. Thanks to Jerry and Pat early for their incredible welcome as always and see you soon again !